As the company that brought to the world the Infinity Display, S Pen technology and best-in-class smartphone cameras, Samsung has set a high bar for excellence on its flagship Galaxy S and Galaxy Note devices. Now Samsung is bringing the innovative spirit to its other product lines, starting with the launch of the Galaxy A7 and Galaxy A9. Featuring an all-new camera setup and a revamped design, the devices are a fresh angle on Samsung’s high-end phones. 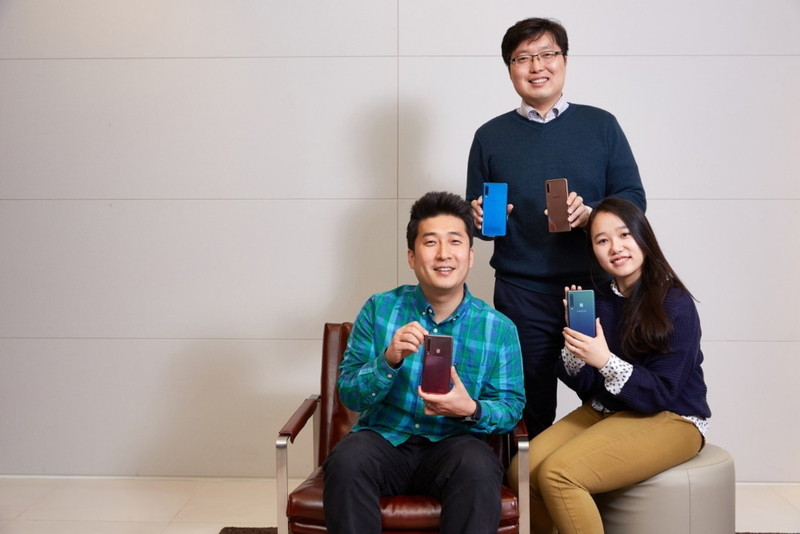 Samsung Newsroom spoke with members of the Global Product Planning Group–product planners Minseung Baik, Kwangsub Bong, and Sunmoek Jung –who discussed how they injected a new DNA into the Galaxy A product line. His favorite of the new features is the Ultra Wide camera, citing its versatility. “When traveling you’ll often find yourself in situations where you can’t capture the whole scene on your phone – like a very long bridge or a large group of friends to capture in a single picture,” he said. “In these cases, you can choose the Ultra Wide camera and photograph the whole landscape. The lens will catch almost everything you can see, notably different from that taken with a normal smartphone camera with a 77° view.” Bong adds that it was about more than just making new lenses. “We focused on creating new user experiences with the new multiple cameras,” said Bong. “People will be pleased to find, for example, more intuitive and smoother transitions when switching between camera functions. Other features include the ability to add a watermark to a photo, so users can add their own personal touch to their images.1” It all adds up to a phone that, Jung says, better suits the younger generation than previous flagship devices. “The motivations for the new product came from the behavior of millennials who like to use social networking services, vlogs and other multimedia systems for communication,” Jung continued. With usage patterns showing that smartphone cameras were mostly being used by millennials for taking selfies, traveling and nightlife, the team designed multiple cameras for both the Galaxy A7 and Galaxy A9 to provide users with more options when they are taking snapshots – which, in other words, gives the younger generation an even wider variety of ways to express themselves through different types of photos. The new multiple cameras are all part of a new philosophy that seeks to bring truly unique features to the devices. Common to both camera setups on the Galaxy A7 and Galaxy A9 are a Depth camera and an Ultra Wide camera alongside the main camera. The Depth camera measures the depth of the image taken, allowing users to add a bokeh effect around their subject with Live Focus, while the Ultra Wide camera provides a 120° field of view, so users can capture the entire scene. The Galaxy A9 includes an added 10MP Telephoto lens with 2x Optical Zoom so that users can get up-close and personal with their subject, even when they are far away. Engineering all of those features to fit into one phone meant taking a whole new approach to the design. 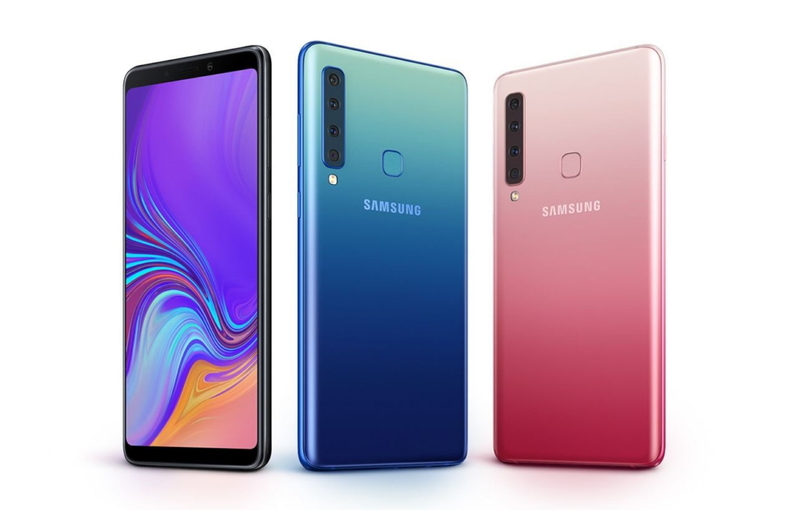 The new Galaxy A9 devices come in a range of colors, including two unique gradient options in Lemonade Blue and Bubblegum Pink. The gradient design was a feat of engineering in its own right, requiring trial and error to get the right look. The result of these efforts is a smartphone designed for millennials who want a stylish and convenient mobile experience that brings the best of the Galaxy design heritage to suit their modern, busy lifestyles. With this new approach in mind, the Galaxy A series will continue to evolve to meet the needs of millennials and like-minded individuals in the future. 1Watermarks are currently only supported on the Galaxy A9, with availability pending updates for the Galaxy A7 shortly.